Cinnamon Toast Crunch Pancakes- because breakfast is always better with pancakes, but who could ever turn down Cinnamon Toast Crunch cereal? In a small bowl, whisk together flour, sugar, baking powder, 1 tsp cinnamon, and salt. Stir Cinnamon Toast Crunch cereal into mixture. Slowly pour the dry ingredients into the wet ingredients, stirring until they’re just combined, but being careful not to over-mix. Heat a griddle or frying pan over medium heat and pour about 1/4 C batter onto it. Cook pancakes for about 2 minutes on each side, until they’re nicely browned. Repeat with all batter. 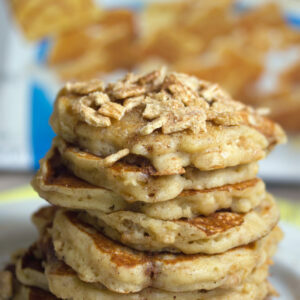 Stir the remaining 1 tsp cinnamon into the maple syrup and serve syrup over a stack of pancakes. Crumble additional Cinnamon Toast Crunch cereal over the top, if you desire.